Case studies of our LED Plant/Grow Lights in action. This section lists some of the more recent field trials of our advanced LED grow-lights, with a close match to the McCree curve and natural sunlight, with many different types of crops. We have provided a Hong Kong Aquaponics Greenhouse with a sample of our 45W Linear LED grow light. 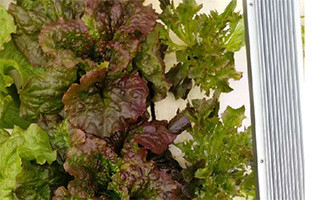 These are the preliminary test results from the first growth cycle which showed that exposure to the McCree curve light (with extra UV and blue), increased the size of the red lettuce by 3 times! 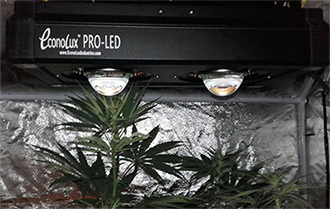 We provided one of our PRO-LED-200WTM Grow Lights (since discontinued and replaced with the more compact and lighter weight PRO-LED-100TM lights). After two trials, the 200W lights with McCree curve spectrum grew about 16% more Cannabis than the previous 400W HPS light while saving more than 50% in energy costs, and with significant heat reduction. The EconoLux YouTube channel has interesting and informative videos about our products and technology, as well as videos by others on hydroponics and vertical farming, for your edification and entertainment.